after making my anthro-inspired scoop top (which i love and wear all the time) i knew i needed to make a woven version. aaaaand since the scout has been calling my name for quite some time, it was time i heeded it’s siren call. i made a size 4/6 with a 1/4″ forward shoulder adjustment on the sleeve. for that, i took my sleeve piece and removed 1/4″ from the front seam (the part under your arm) and added that 1/4″ to the back seam. this rotates the sleeve head forward, placing the fullness in line with the point of my shoulder. i didn’t mess with the shoulder seam because it is already more forward than typical, though i can see that the seam isn’t exactly parallel with that imaginary line from the base of my neck to the point of my shoulder. the fit seems fine so i probably won’t bother messing with it. i would like to take out some room in the bust area, but since there are no darts to fiddle with, i’m not really sure how… thoughts anyone? get used to seeing these shorts a lot. i wasn’t kidding when i said they match everything in my closet! i decided to give this top the swoopy back feature. if you look at jen’s post on it, i simply kept that top part as a yoke, and added the swoop and a little room at CB to pleat where it joins the yoke. 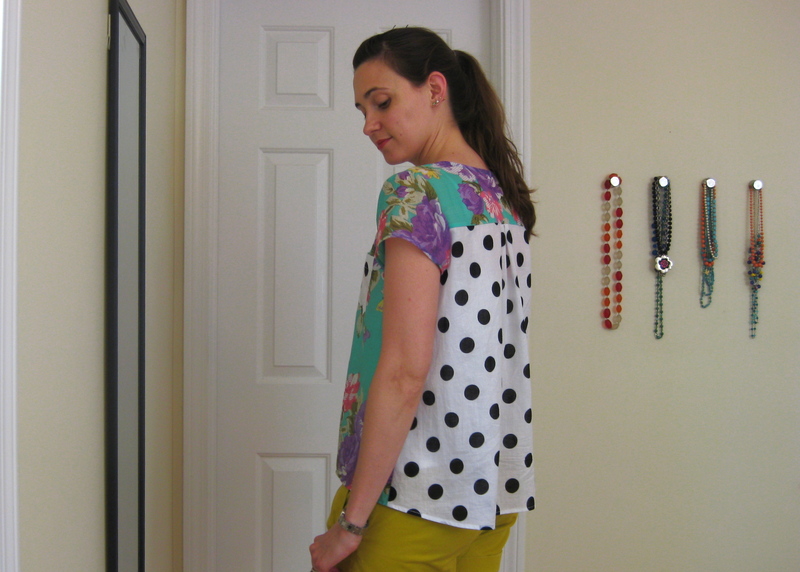 this top is super comfortable and i completely get why everyone is head over heels for this pattern! it’s just… perfect. i want a whole closet full of them now. oh, and i frenched every single seam, so points for neatness and not having to change thread on my serger… ahem. let’s talk about my fabric choices for a minute. i finished this top a week ago but was a bit mad at it as i came into the home stretch. i loved these fabric prints together—the polka dot keeps the granny floral from looking too… granny. but when i ordered them, they were billed as 100% cotton. and i assumed this was the case, but by the end i finally realized that the floral print no way no how could possibly be 100% cotton. now, i’m not a poly snob. we hang out on occasion. but i don’t like her sneaking into the party when i’m expecting someone else! my concern is how the two fabrics will wash and wear together. cottons tend to fade and perhaps shrink (i’ve pre-washed) while polys don’t do any of that. over time, i suspect the two fabrics won’t look so grand together, but what can ya do. the good news is, i have quite a bit of each of these fabrics left over. i really love the floral print, so hopefully it will show up in a skirt at some point; and the polka dot… well i may or may not have already cut out an archer from, the sewing of which will have to wait because i have other projects to get to, and it’s like a billion degrees outside. so. hot. i’ve completely lost my midwest heat-enduring toughness. for some reason, we all love to knock off anthropologie garments. i don’t know why… maybe it’s because of their use of kitschy fabrics on high-ish end clothing or just their unique style. for me it’s because every time i browse i inevitably shout: “hey, i could make that! and for a quarter the price!! and not use polyester!! !” i’m quite a spectacle sometimes. i checked out their blouse selection recently because i have some silk chiffon fabric i’m just not sure what to do with and needed some inspiration. i ended up finding none, but did come across this super cute top and immediately knew what fabrics i wanted to use to make my own. the anthro top is a woven, but it reminded me of some knits at girlcharlee and next thing i knew i was adding fabrics to my cart and well you know the rest. 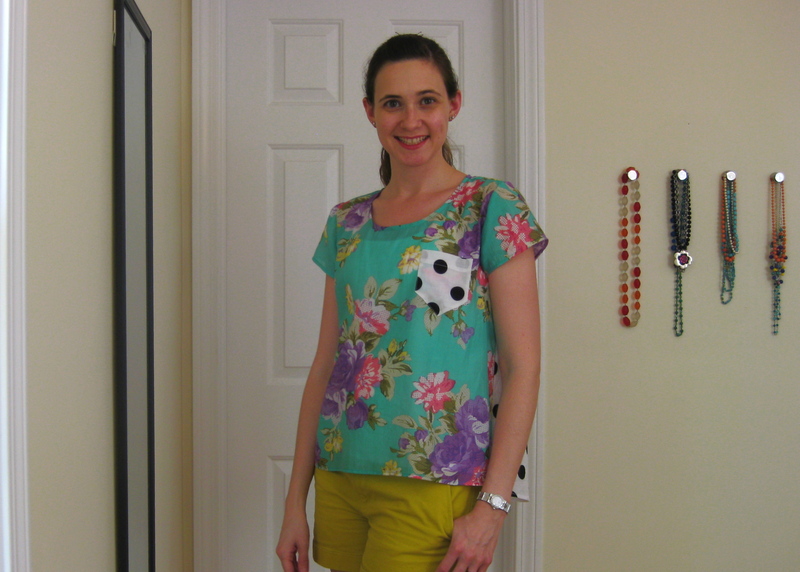 i also recently came across the super awesome and FREE scoop neck tee pattern by skirt as top and knew it would all be a perfect match. i love that it is fitted through the bust and swingy at the hips. i used to be terribly self-conscious of swingy tops, and avoided them at all costs. why? probably because i spent nearly six consecutive years of my life pregnant or freshly post, and well once you have four kids people just assume you’re going to have at least six or ten more and are suspicious at any wearing of swingy tops. but, now that i’m more than four years removed from all that it’s time to let the swingy tops back into my life. the pattern comes in one size, small/medium (for reference i usually wear a 4-6 in RTW tops) and has a deep scoop neck and kimono-style short sleeve. i wanted a regular sleeve so i took a size 8 tracing of my renfrew and used that as a guide to make regular armholes and short sleeves. 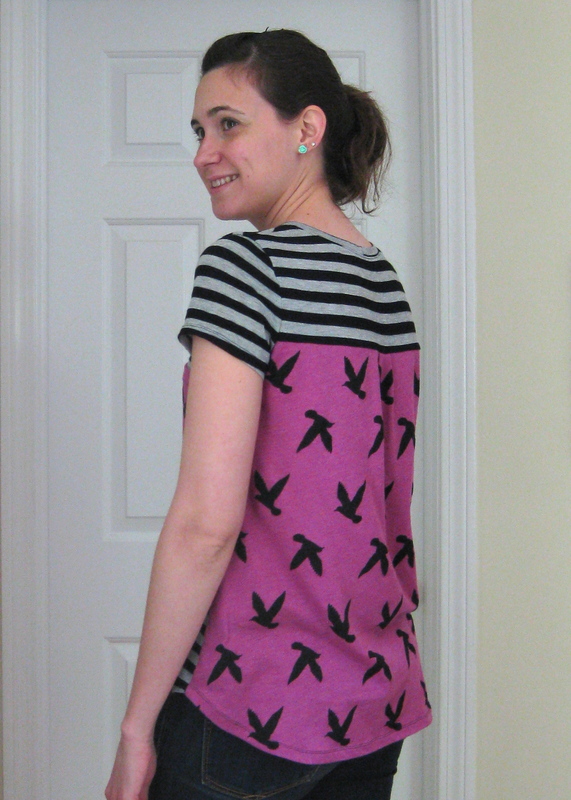 i also raised the scoop neck by 1″ and cut my binding narrower than called for. 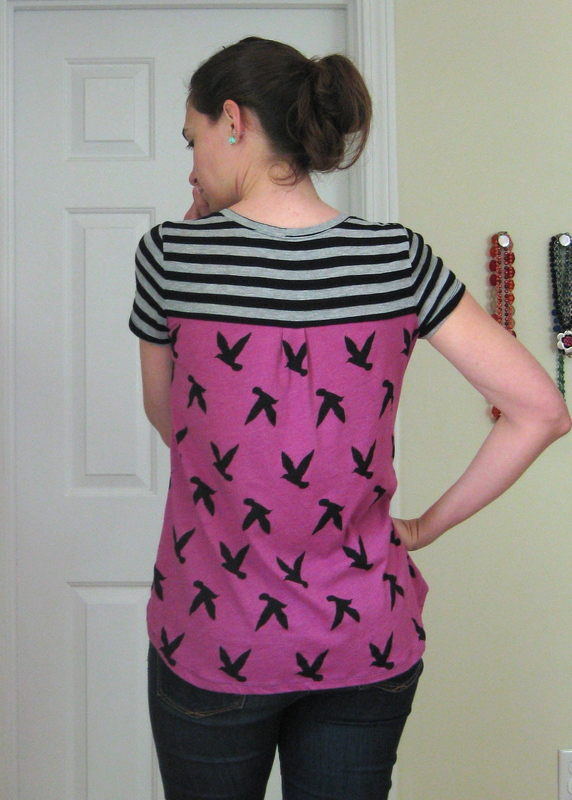 for the back, i cut the pattern across the back to make separate yoke and lower back pieces. i added 1″ at CB on the fold (so 2″ total) to make a pleat when joined with the yoke. i’ve always wanted to experiment with print mixing, and i really love how these two work together; fun but not too cray-cray. 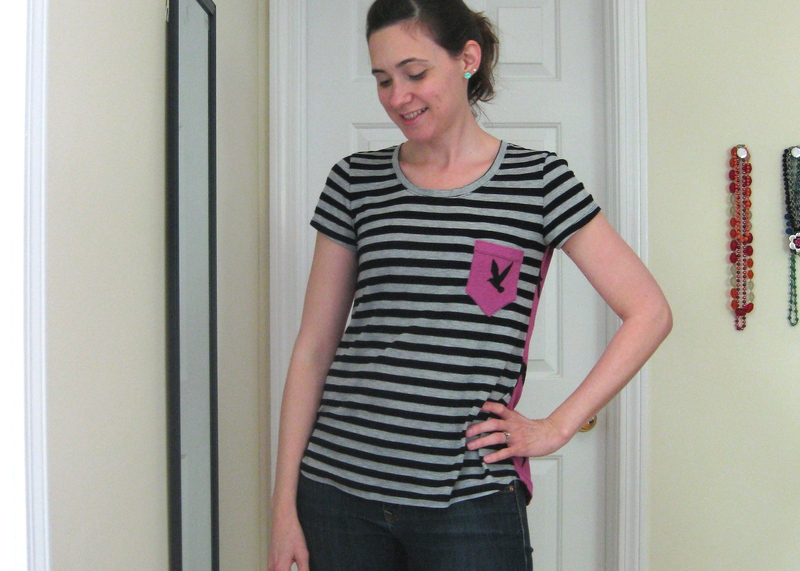 the striped knit i used turned out to be one of those impossible to work with rayon blends. every single time i use this type of knit i just want to tear my hair out! this neck binding is far from perfect (i was trying to get only the grey part to show) but since it was actually my third attempt at binding this neckline (the first time i used a different method and it looked truly awful, the second was way too wide and looked dumb) i couldn’t be bothered to care anymore if it was in fact perfect. the bird portion is also a rayon blend, but of the far more stable and super easy to work with variety. 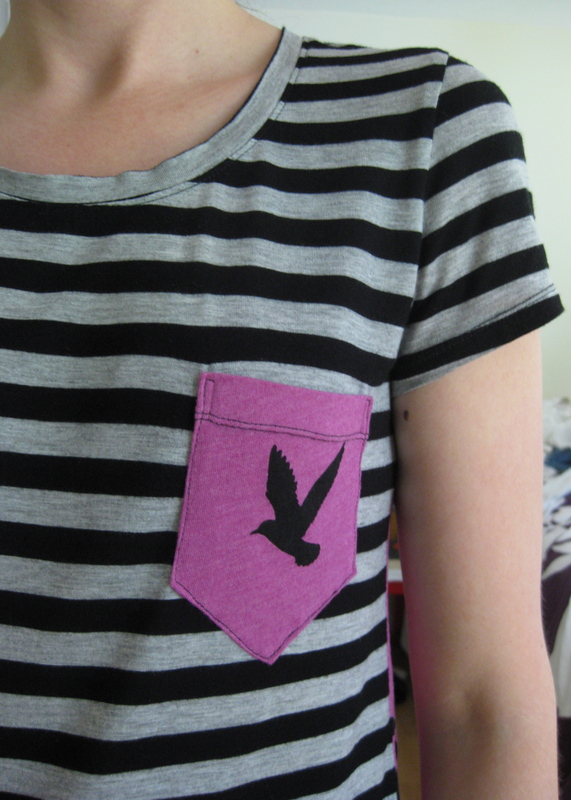 in truth, i assumed the bird print would be significantly smaller than it turned out to be. i was relying on what i saw last year when everybody and their grandmother was using this bird print. and, well, i didn’t stop to check details like that when i suddenly had to have the fabrics right now! it caught me off guard when i ripped open my package, but i quite like the large scale now that the shirt is made up! 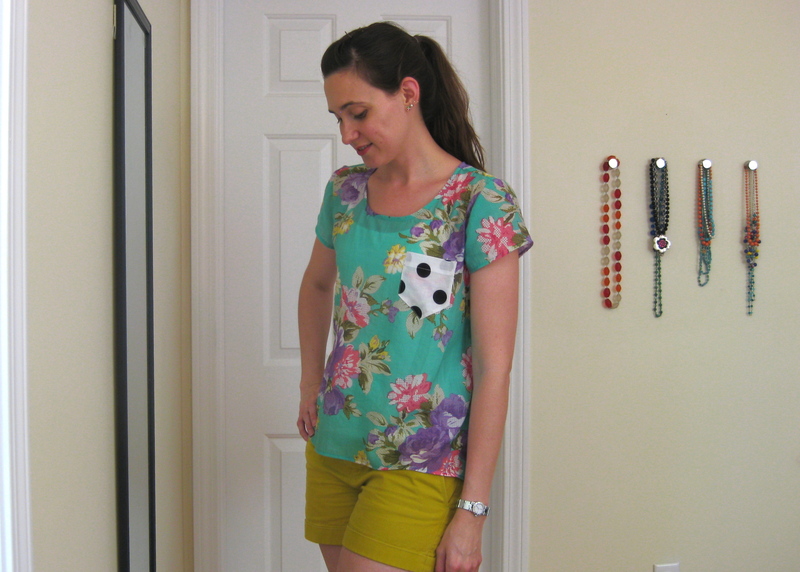 while this design worked great with the knit scoop neck tee pattern, it would be superb as a variation of the scout tee in a woven (kelli of true bias made something similar recently—gorgeous!). in fact, it would be a great way to use up those odd bits of leftover fabric. i totally love this tee, and i’m super inspired to do more color/print blocking to make my basics just a little more fun!